Freedom Wheelchairs (based at the Chiang Mai Disabled Center) have recently celebrated two significant milestones: their second birthday and fiftieth wheelchair donation. 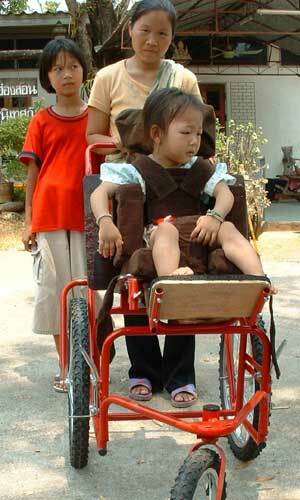 Dthai Suanalam, a 3-year-old little girl, with her new Cerebral Palsy ‘buggy’. 5-year-old boy Puwadon Wormalalot with a new wheelchair. Both Puwadon and Dthai are from the village of Tam Lod (famous for its cave system) in Mae Hon Son. The fifty mark was passed during a recent trip to Mae Hon Son, where six wheelchairs, including two special children’s Cerebral Palsy ‘buggies’, were donated free of charge to needy recipients, who otherwise would never have been able to afford to buy such products. Alongside the provision of wheelchairs and other mobility aids (such as children’s walking frames), a ‘follow up’ program visits recipients and their families on a regular basis to provide physical and occupational therapy, motivation and encouragement, and general advice on where and how to access health, education and benefit services. Such a package of provisions is necessary, as families (especially in rural areas) have no knowledge of their rights or of the services available to them. In cases of severely disabled children, simple advice to parents on nutrition or exercise can transform the lives of recipients. Parents are given hope that their child can develop, get an education and gain a worthwhile quality of life. By making weekly visits to different areas and communities across northern Thailand and in establishing links with provincial Special Education Centers and the Northern Child Development Center, in Chiang Mai, it has been possible to reach and help many disabled children who would otherwise have “fallen through the net”. The numbers of candidates for the program are increasing all the time and new, larger production premises are presently being sought to help cope with the increased demand. The wheelchairs and mobility aids are provided through a well-established sponsorship program which allows for goods and services to be provided free of charge. The cost of a sponsorship is currently 8,000 baht. 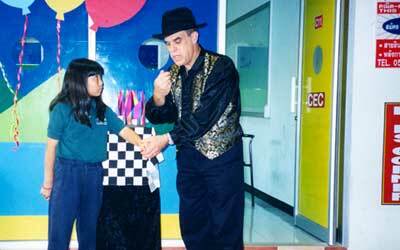 A magician came all the way from San Diego, California, to entertain the kids at CEC Language and Computer School. The little ones, as much as the parents and teachers, had a lot of fun during the sessions which were filled with balloons, tricks, card games and everything else a magic man can do get children’s hearts beating faster. 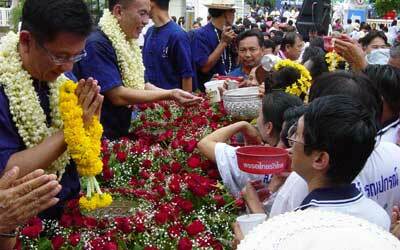 Chiang Mai people and representatives from several organizations formed a parade and marched to Chiang Mai Municipality to pour water blessings over Mayor Boonlert Buranupakorn (left) and Pakorn Buranupakorn, Chiang Mai MP (second from left), on the occasion of continued Thai New Year celebrations on April 18.